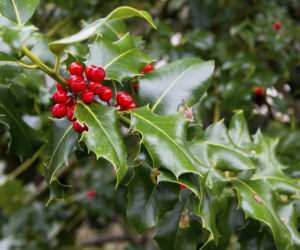 Holly Shrubs and trees have, over the years, become one of the most iconic Christmas plants. Not to mention that, because they’re evergreens, they’re a boon to any winter landscape, providing some much needed color and life to otherwise dead yards. If you’re interested in improving your landscape this Christmas you can’t go wrong with a subspecies of Ilex (the botanical name for the holly species of plants). But there are actually quite a few kinds of holly out there, so how do you choose one? The Atlantic Maintenance Group is here with the top 4 kinds of holly that make for great winter landscapes. Despite the name Blue Princess holly shrubs are not actually blue. While it’s conceivable that the name was given in reference to it’s very deep, dark green leaves, there’s a solid chance that “blue” was dreamed up by the folks in marketing. Officially called Ilex x meserveae, Blue Princess boasts holly’s iconic red berries, which can add a great deal of color to your yard around Christmas, although it may require protection from winter-famished fowl in the area. Officially called Ilex crenata Hetzii, Hetz’s Japanese Holly, with its small, rounded, bright green leaves, might easily pass as a boxwood to the untrained eye. This holly bush produces richly black berries and makes for a great hedge shrub, especially during Christmastime and the winter season. It’s worth noting that if you notice Ilex crenata is the botanical name of a plant that means it’s a Japanese holly. Another Ilex crenata, the Sky Pencil, like Hetz’s sports tiny, round, green leaves and black berries. However, that’s where the similarities end. Sky Pencil Holly grows like a column, reaching somewhere between 4-10ft tall with a width about a third of the height. Vertical plants like this one are excellent for framing entryways, or can be planted at the corners of a foundation to “bookend” your entire house. Sky Pencil holly is a great accent plant for winter and can help keep things festive and lively come Christmas. Ilex verticillata, also known as winterberry is an exception to the holly rule. While the majority of holly shrubs are praised for being evergreen, keeping their lush foliage year-round, Winterberry is deciduous, meaning that it loses its leaves in winter. It’s actually for this quality that it’s so desirable, because while Winterberry’s leaves are rather plain, once their gone it sports tremendously bright and vibrant berries that last year round. If you want to add some color to your yard, that isn’t green, Winterberry makes for a great Christmas shrub. And a lot of other things too. Were you’re gardening and landscaping professionals during winter and all year round. We’re a full service landscaping company, providing maintenance, design and construction, as well as snow removal, asphalt and concrete services. We are your source for complete landscape and facility maintenance for commercial and residential properties throughout Maryland, Virginia, Pennsylvania and Delaware. Our highly trained team of professionals receives constant, ongoing education on the latest industry trends, updates and safety measures. This ensures we can deliver outstanding customer service and results to our clients, regardless of the size of your job. This entry was posted on Tuesday, December 9th, 2014	at 5:30 pm	and is filed under Lawn Tips	. You can follow any responses to this entry through the RSS 2.0	feed. Both comments and pings are currently closed.